The Wellington and Manawatu Railway (WMR) Company’s locomotive No. 10 established a world speed record for the narrow 3 foot 6 inch (1067 mm) gauge, averaging 68 km per hour on a two-hour run and hitting a top speed of 103 kph. 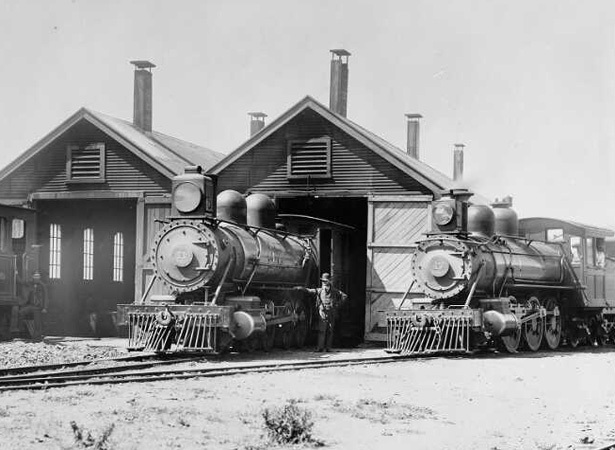 From the time of the WMR’s formal opening on 3 November 1886, its American-built Baldwin locomotives, comfortable passenger carriages and well-appointed dining cars frequently outclassed their counterparts on the government-owned New Zealand Railways (NZR) network. No. 10 was one of two 2-6-2 ‘Prairie’ locomotives (similar to NZR’s N class) the company had ordered from Philadelphia’s famous Baldwin Locomotive Works in 1891. In July 1892 No. 10 ran a speed trial over the 135-km WMR route between Wellington and Longburn, just south of Palmerston North, hauling a single passenger car and van. Driver Fryer and Fireman Taylor were joined in the cab by the company’s Locomotive Superintendent James Fulton, his assistant James Marchbanks, and the well-known rail journalist Charles Rous-Marten, who timed the run. The trip was completed in 1 hour 58 minutes running time, an average speed of 68 kph; between Ōtaki and Longburn the average was 78 kph. As the train crossed the Makurerua (or Makerua) Swamp near Tokomaru it reached a top speed of 103 kph. There’s a heavy roar as the bridge is crossed, and she is free on the plain. She’s breaking her heart for a record run, by the Tokomaru swamp. When the WMR Company was taken over by NZR in 1908, No. 10 was renumbered N 454 and later served in Wairarapa and Westland. Withdrawn from service in 1928, the historic record-breaker was dumped in the Waimakariri River. Its twin sister, No. 9 (renumbered N 453), is being restored at Paekākāriki. We have 7 articles, related to Steam locomotive sets world speed record.